Work demands have limited my blogging activity. However, in catching up on the bicycle commuting news, a couple items in September seem important to share. One item is this video, which highlights bicycle encouragement programs at the National Institutes of Health, Discovery Channel, and Google. Whether it's due to rising popularity of the green movement or recent sky-high gas prices, many workplaces are gearing up for an increase in bicycle traffic...The Sears Tower offers bike-friendly services to its more than 100 tenants and is ready to add more. "We roughly quadrupled our (bicycle parking) capacity (last) September," said Tom Dempsey, vice-president and general manager. There are now 49 indoor bicycle parking stalls in the garage on the first level, 44 of which are being leased to tenants for $25 per month or $200 per year. "If we lease up the next five stalls, we would definitely add more." Bicycle commuting is more appealing when your workplace is supportive. There are many advantages to those employers that encourage bicycle commuting, including improved health of employees, better morale, reduced absenteeism, and reduced demand for vehicle parking. And employers who offer a diverse mix of transportation access have a competitive advantage recruiting the most talented staff. How does your employer support bicycle commuting? What incentives or support might your employer offer to encourage more of your colleagues to bicycle commute? Health club membership? Cash for bicycling mileage? Secure bicycle parking? Thanks to TheRealEdwin at Current for sharing video link. 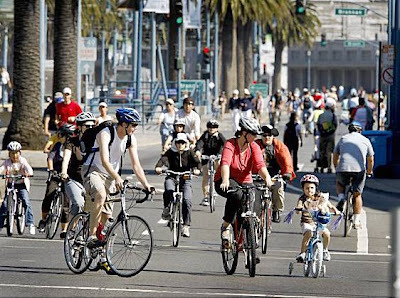 LAS VEGAS--It's never been a better time to be in the bicycle business, what with global warming, childhood obesity and a failing economy. The nation may be wracked by collapsing banks, foreclosed houses and a tanking economy, but there's no sign anything's amiss here at Interbike, the bike industry's annual trade show. In fact, it's party time as a perfect storm of eco-conscious consumerism, health-conscious lifestyles and wallet-sapping gas prices conspires to get people out of cars and onto bikes -- especially electric ones. "The gas prices are the best thing that ever happened to cycling," says Kevin Menard, whose year-old custom bike business, Traitor Cycles, is thriving. "I hope they go up even more." The gargantuan trade show, and the crowd filling it, has never been bigger, organizers boast. A record 23,000 people and 750 exhibitors fill several acres of the Sands Convention Center, further proof that all is well in the bike biz..."You can feel the collective buzz," a smiling Tim Blumenthal, executive director of the bicycle advocacy group Bikes Belong, says from the middle of the bustling show floor. "It's a really, really heady time for us. This show feels very optimistic and that bucks the general economic trends. There doesn't seem to be many businesses that are thriving, but the bike business is doing very well." Interbike wrapped up last week, and from all reports, the bicycle industry is bullish on future growth. This is the same industry that long neglected the commuter market, as it chased the performance athlete and the single-track trail shredders. It's nice to see the industry finally waking up to the obvious market potential of the 98 percent of Americans who presently don't commute by bicycle. 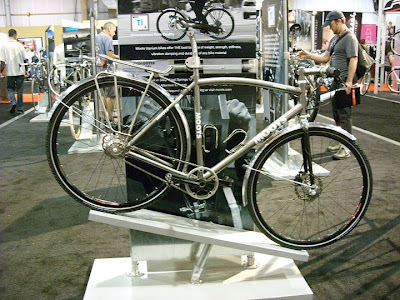 For complete Interbike coverage, see Cyclelicious and CommutebyBike.com. One product category making a splash at Interbike is electric bicycles. As a traditional pedaling bike commuter, I have mixed feelings about electric bikes. I suppose I'll welcome more car-less commuters, even if they are on powered rides. But it feels a little funny to me. Electric bikes may reduce congestion and pollution, but won't address the public health issues of low physical activity levels among Americans. I'm also concerned about the safety issues (speed differentials, braking, noise, etc.) that arise from mixing powered and pedaled bicycles in dedicated bike facilities (bike lanes, bike paths). But maybe I'm just being a cranky geezer. Your thoughts? Are electric bicycles a form of vehicular or cycle commuting? Visit: Schwinn’s New Tailwind eBike: 25 To 30 Miles On A 30 Minute Charge, OhGizmo! Bike shop sales strong across the U.S.
Hal Trovillion, pastor of First Baptist Church of Manteno, rides his bike four blocks to his church every Sunday. "I have ridden my bike to church for a couple years," Trovillion said. "It saves me money, but I mainly use it for exercise. It can also be eco-friendly." Trovillion is not alone. As the cost of getting from here to there increases, local stores have reported a spike in bicycle sales as more people look for alternative means of transportation to save money...high fuel prices and eroding consumer confidence led more people to reach for Kryptonite bike locks rather than car keys. And strong sales continue even as winter approaches, bike shop owners say. The national trend can be seen at Tern of the Wheel bike shop in Bradley. "We have experienced a 10 percent increase in sales compared to last year," said owner Steve Linneman. "People are saying they want to ride their bike to work because they can't afford to put gas in their car." At the autumn equinox, we can perhaps declare Summer 2008 to have been the season Americans rediscovered the bicycle. This article from Illinois indicates that bike shops all over the country are reporting increased sales. All year, we've seen evidence of flourishing bike sales across the U.S., from Massachusetts to Ohio, to Florida to Oregon. The cost of gasoline is clearly a factor--about 30 percent above last year's price at this time. This article from "middle America" is further confirmation that the bicycling trend isn't just a phenomenon of the coastal areas or college towns. Bicycling is sweeping the nation. My publisher, Adams Media, contacted me this week to inform me that marketing had begun for the book project that kept me busy much of the summer. The Bike to Work Guide: What You Need to Know to Save Gas, Go Green, Get Fit will ship in November, be in stores by December, and be on sale everywhere by January. It's now available for "pre-order" on Amazon.com and elsewhere. Affordably priced at only $7.95, the Bike to Work Guide offers a lot of helpful information to those considering commuting by bicycle. This book owes a great debt to readers of this blog and my Bike Commuting Tips website. Your comments, questions, suggestions, and criticism have informed my understanding of bicycles for transportation. I am very grateful for your comments and messages. Please continue to respond to my site and blog; your comments are hugely appreciated. Clearly, more people are considering bicycle commuting these days. My book is only one newly available resource responding to this new interest and demand. 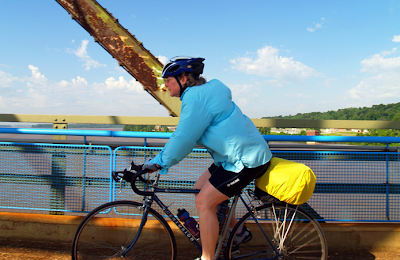 (My site and blog have encouraged commuting by bicycle for more than 10 years.) Another exciting new book project, Bike to Work, by Tim Grahl of CommutebyBike.com and Carlton Reid of BikeforAll.net, will also appear this fall. 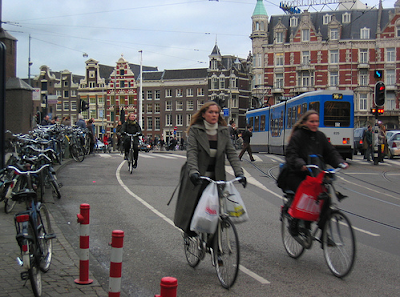 It seems that 2009 will be a promising year for the growth of bicycle commuting. International research reveals that as cycling participation increases, a cyclist is far less likely to collide with a motor vehicle or suffer injury and death...And it's not simply because there are fewer cars on the roads, but because motorists seem to change their behaviour and drive more safely when they see more cyclists and pedestrians around. Great news from Australia, confirming earlier research by Peter Jacobsen and others, that motorists adjust their driving behavior in the presence of bicyclists. This research will help bolster advocacy arguments for enhanced bicycling facilities and encouragement. The researchers also suggested policy makers emphasize the positives of bicycling--fun and health--rather than safety concerns: "We should create a cycling friendly environment and accentuate cycling's positives," said Dr. Chris Rissel. "Rather than stress negatives with 'safety campaigns' that focus on cyclists without addressing drivers and road conditions. Reminding people of injury rates and risks, to wear helmets and reflective visible clothes has the unintended effect of reinforcing fears of cycling which discourages people from cycling." Amen to this. Stop perpetuating the myth of bicycling as a dangerous activity. Leave your helmet at home. Image: Web capture. 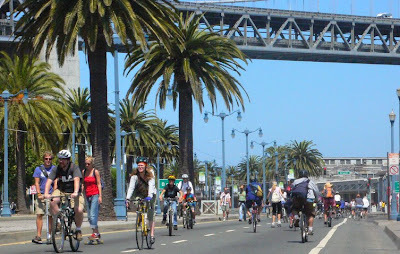 Sunday Streets in San Francisco. The Dutch rely ever more on the humble bike for transport as pollution concerns and high petrol prices give new impetus to traditional pedal power in the only country with more bicycles than people. The average Dutchman cycled 902 kilometres in 2006, up 16 kilometres from 15 years ago, according to official statistics. Annual new bike sales rose by 80,000 in 2007 to 1.4 million as the Dutch, known for their thrift and pragmatism, shunned the comfort of gas-guzzling cars for the cheaper, greener alternative in a year marked by record oil prices. Hard to believe, but even in the most bicycling intensive culture on the planet, higher priced fuel yields more bicyclists. In a period of rising energy prices, those nations and communities that wisely made prior investments in bicycling facilities--such as the Netherlands and Portland--will see greater growth in bicycling, as other communities struggle to catch up. This will likely yield a competitive advantage to these communities, as enterprising and creative younger commuters seek a shorter commute and better quality of life. To say I'm oblivious is an understatement; I'm male, graying, and, um, male. So the other day when my wife and I were in a local REI store, I didn't immediately grasp her point. "Look," she said. "Look at that." Er, look at what? "At that! The last time I was looking for a bicycle bell at REI," she said, "I had to look in the children's section." Indeed, there was a healthy selection of bells and other commuter-related bicycling paraphernalia in a dedicated "Commuting" section. Despite some signs of a shift, the bike industry as a whole remains very much in the business of selling recreational equipment. A quick leaf through Bicycling will tell you that. For two decades the bike industry has pursued performance enhancements that offer precisely no benefit to commuting bicyclists, offering high-tech toys to competitive or athletic bicyclists. You know, maybe .5 percent of the American population? Us bicycle commuters? Well, we just kind of "got by." We commuted by bicycle in spite of the bike industry, not because of it. 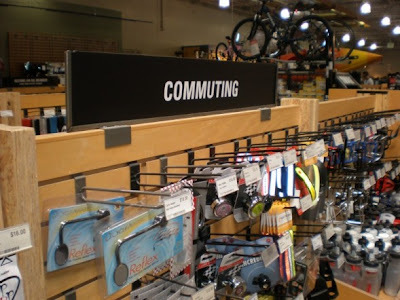 A "Commuting" section at REI. Another sign of the bicycle industry's growing interest in the bicycle commuting market? Maybe?!? TACHIA, Taiwan -- Antony Lo is one happy biker. He is 60 but looks younger, with a body buffed by commuting 130 miles a week on his bike. He is also president of Taiwan-based Giant, the world's largest bicycle company, where sales are soaring, helped along by global anxiety over oil prices. With undisguised glee, Lo says: "High-priced gasoline is here to stay. I tell my people we are just at the beginning of a very big cycling boom." Boom it is...Yet when it comes to using a bike for everyday transportation, the boom appears to have bypassed many countries. While Northern Europe and Japan have figured out how to make bicycle commuting a safe, cheap alternative to driving, the United States, Canada, Australia and Britain have not. And the world's two most populous nations, China and India, are discarding bicycles in favor of cars. A rising middle class in both countries views cycling as an unhappy reminder of the recent past, when nearly everyone was poor. Still, among the world's most developed countries, a reliable recipe has emerged for making cycling a mainstream means of getting to work. Commuters in Northern Europe have been lured out of their cars by bike lanes, secure bike parking and easy access to mass transportation. At the same time, steep automobile taxes, congestion-zone fees and go-slow rules have made inner-city driving a costly pain in the neck. In the Netherlands, where such carrot-and-stick policies have been in place for decades, 27 percent of all trips are by bike. "It is very clear how to do this," said John Pucher, a professor of urban planning at Rutgers University and lead author of a global study of strategies that promote cycling. "It is not rocket science." Impressive article in the influential Washington Post, featuring reporting from Beijing, London, New Delhi, Berlin, and Tokyo. There is also a video on the impressive robotic bicycle parking facility built in Tokyo. The lesson from all these cities is: "If you build it, they will come." Bicycle facilities attract bicyclists.